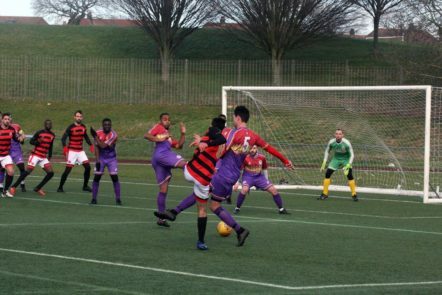 Storm Erik was a wildcard factor in this closely-fought encounter between North West London and Clapton CFC in Haringey. It was the hosts who took the three points in this hastily-rearranged game courtesy of a contentious late goal against a weakened but battling CCFC side. 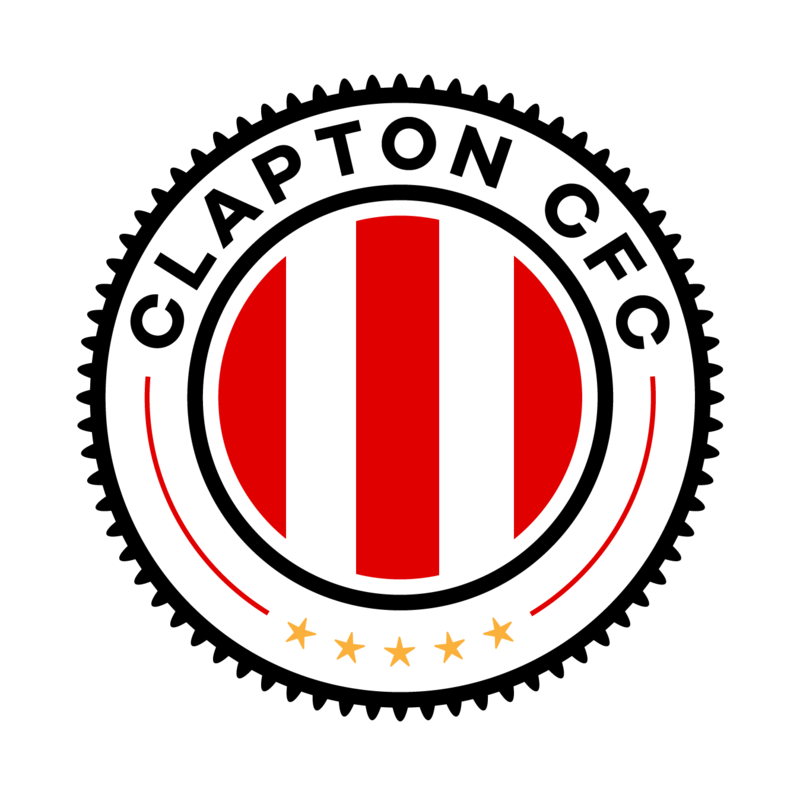 The management of Clapton had had a difficult week in terms of squad selection, with 13 players unavailable due to injuries and work commitments. Then during the warm-up, sub Imran Rehman pulled up injured too. However, due to the depth of the squad, the Tons were still able to card a competitive looking side for the lunchtime trip to neutral territory. The New River Stadium is not NW London’s usual home ground, however the venue, with its 1,000 seater grandstand and plentiful terracing, provided a great backdrop. The game made history as it was first ‘Rage Sport derby’ featuring two teams wearing the manufacturers’ designs. It was also the first Tons match to be streamed live online, courtesy of the hosts. 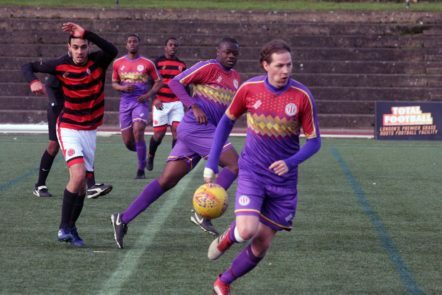 Yesterday we took part in the first ever ‘Rage Sport derby’ – the first official game between teams wearing kit from the non-profit, ethical manufacturer. Our opponents, known as the Gorillas, have been having a strong season in their second year as an MCFL team. Currently sitting second in the table, they apparently train three times a week and have strong ambitions for promotion this season. They have scored more goals than any other team in our division, averaging 4 per game, so the key was always going to be if the Tons defensive line could hold firm. At kick off time, Storm Erik was cracking the flags (and less well secured parts of the dugouts) with a strong wind from the west that would keep up throughout the game. NW won the toss and chose to make Clapton play into the wind for the first half. 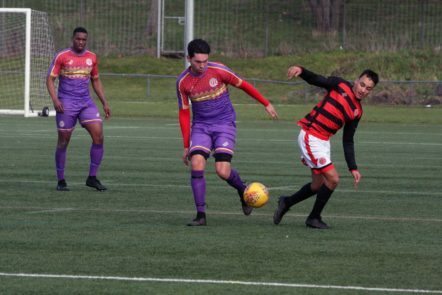 The first chance came for North West when Ezequiel Franchi was able to cross the ball into a dangerously placed Pedro Cotelo, however a tight Clapton defence were able to shut down the attack and stop a shot on target from being made. This was followed shortly afterwards by a long range effort from Dante Cobianchi. The shot from well outside the box was carried at speed by the wind, however Tons keeper Dan Anfossy had plenty of time to position himself and make the block. The first real worry came from another period of pressure by North West. Several corners led to a low shot through a crowded box. The ball ricocheted off the post and was successfully cleared, leaving the woodwork and some Clapton nerves rattling. Another series of NW corners showed that the game was likely to be decided by the low balls, as the attackers struggled to keep any looping crosses on target and resorted instead to trying to make chances through moving the ball around. After fifteen minutes of play Clapton finally managed to push into the home half of the pitch. A North West handball gave Stefan Nielsen the chance to take the lead with a free kick from the edge of the area. The low shot made its way through the crowd but safely past the left post. NW continued to push up, on twenty minutes their Brazilian midfielder Rafael Ferreira found himself with plenty of space on the left wing. Anfossy rushed forward to block Ferreira’s initial shot, however he was unable to keep hold of the ball which fell to an unmarked Cobianchi who had come out of nowhere to mop up the rebound. There were some muted calls for offside, however the goal came more from a Clapton defensive lapse than any monkey business by the Gorillas. 1-0 North West. Five minutes later Franchi came close to making it two for the hosts, ploughing through the defence to get into a shooting position. Anfossy did a good job of making himself big in the goal and in the end Franchi’s effort went wide. 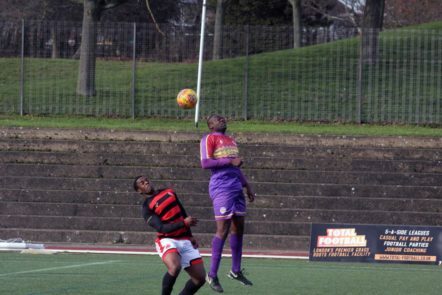 As the first half went on, Clapton began to find their feet and were able to put together a string of good efforts that they were unlucky to be rewarded for. 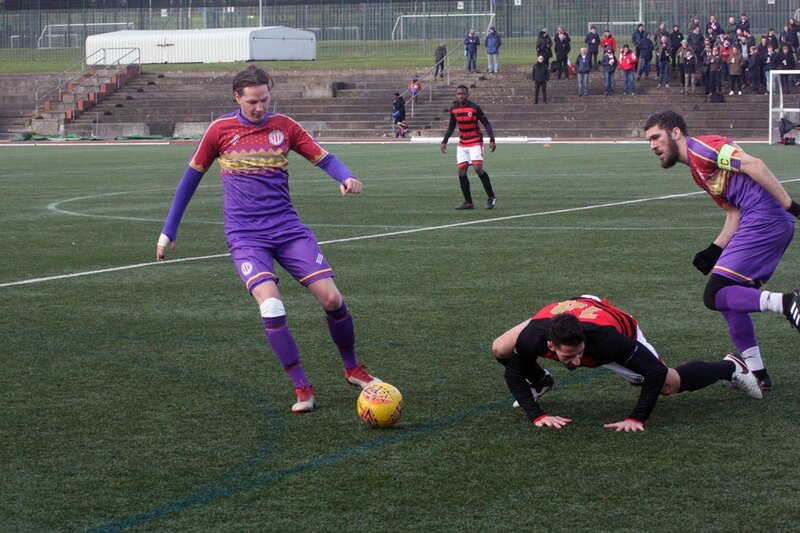 The first opportunity came for Eliot Crosbie who received a long ball in the box, however was quickly surrounded by three North West defenders. The clearance was picked up by the Tons midfield to feed Nielsen who had found space inside the box, his shot was blocked by North West keeper Cole Colbert. In the ensuing scramble, Ellick Coleman was able to crack off a shot that went agonisingly just over the top left corner of the goal. While unlucky not to convert, the sustained attack had got Clapton’s tails up. It also gave the fans on the terrace something to cheer about. 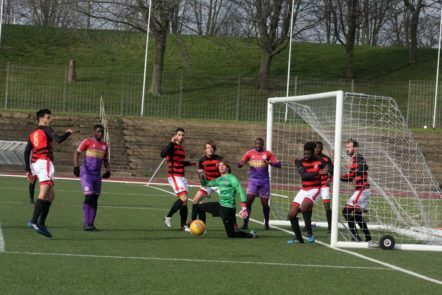 Another Nielsen free kick from a dangerous position on the right sailed across the box to Crosbie whose volley was picked up by the head of Dean Bouho, however his effort went straight to the keeper. Just before the half North West had one last chance to increase their lead with an effort from Franchi. Anfossy’s stop resulted in another rebound however this time there was no onrushing NW player to pick it up. At the end of the half Clapton were only a goal down having played into the wind. Hopes were high on the terrace that with the wind behind them and the Gorillas’ tiring legs, the visitors could overturn NW’s narrow lead. Straight off the restart Clapton began to make chances with Cemal Agdelen sending a powerful long range effort over the bar. That was followed shortly by an opportunity for Crosbie which came via a neat little one-two between himself and Nielsen. 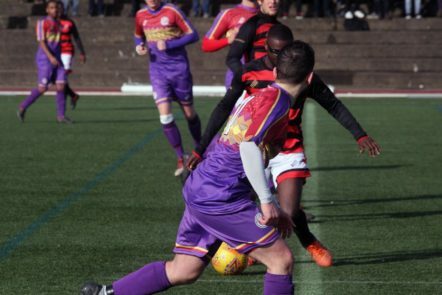 In between Clapton’s sustained presence in the North West half of the pitch, the Gorillas were able to make the odd push forward with Cobianchi sending a weak effort wide followed up shortly afterwards by a corner. However, their attacks into the Clapton area were becoming rarer. 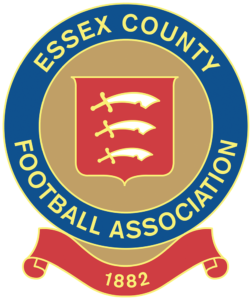 On the hour mark a good chance came for Clapton as Nielsen was pulled back by a defender, the resulting free kick led to a fine ball to Crosbie who was only denied by the linesman’s flag. Another chance came for Crosbie as he forced a diving save from Colbert who pushed the ball out for a corner. In the end the Tons efforts were rewarded when Nielsen was brought down in the area and awarded a penalty. Nielsen was able to hold his nerve and finish the job he started, smashing the ball to Colberts right to tie the game with a little under twenty minutes to play. Clapton continued to pour forward, hoping to finish the comeback and return to the Stray Dog with three points. With just minutes remaining in the game a long pass came in for Cobianchi, the entire terrace yelled for offside. However, the linesman remained unconvinced. The North West forward dashed through and slotted the ball in to Anfossy’s right, sending the Gorillas bananas. With only extra time remaining, the Clapton management took one last roll of the dice. Bringing off Coleman for Tom Carding, the tall Downs FC defender making his first competitive appearance as a Ton. In the final minute the visitors were awarded a free kick from just inside the NW halfway line. Nielsen’s delivery was sent out for a corner from a scramble within the box. With seconds remaining, Clapton pushed the whole squad forward for one final chance on goal. The cross in was sent wide by an NW defender and the ref blew the whistle for full time. 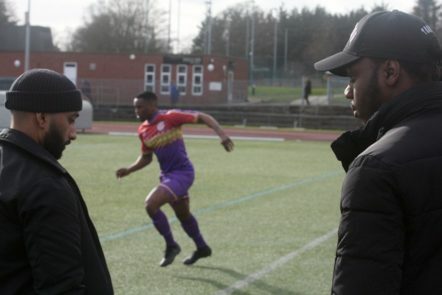 Player-manager Geoff Ocran was stoic in defeat, praising the strong performance from a squad that was playing without many of its key players. The Tons are now 14 points adrift of the runners-up spot in the league, meaning that even with their three games in hand over North West, promotion looks a long shot. 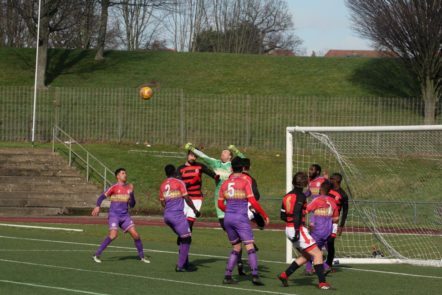 We are back in action at New River on March the 2nd as, in the other fixture of the afternoon, Wilberforce Wanderers defeated FC Roast to set up a Jim Rogers Cup semi final against Clapton. We're live from sunny Haringey, 5mins in, still 0-0. It was a cruel end for the Tons losing in the last minute, but particularly for Dan Anfossy who’d pulled off several worldies to keep us in an end-to-end clash.